Wonderfully presented starter home, complete with a modern kitchen/diner and a separate lounge. Complete with a level rear courtyard, a wealth of character throughout, two double bedrooms, utility room and a three piece bathroom. A beautiful first time buyer home. 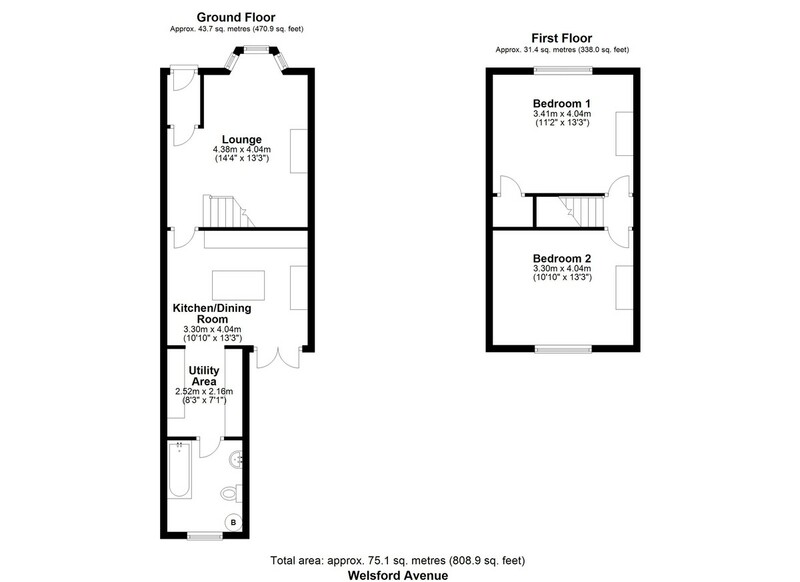 SUMMARY Wonderfully presented starter home, complete with a modern kitchen/diner, separate lounge and a level rear courtyard. With a wealth of character throughout, two double bedrooms, utility room and a three piece bathroom. A beautiful first time buyer home. LOCATION Welsford Avenue is located on Plymouth Dockyard, St. Levan’s Gate area of Stoke, and gives easy access to Plymouth Railway Station and Plymouth City Centre and the Torpoint Ferry. Plymouth City Centre is home to Drakes Circus and a host of local and national shops and restaurants. Welsford Avenue also benefits from easy access to Central Park, plus Devonport Park, St Levan Park and College Road Primary School. The world famous Plymouth Hoe and Historic Barbican are only a short commute away, along with the nationally renowned Royal William Yard. Welsford Avenue also gives easy access to the Plymouth Life Centre, Central Park, which is home to Plymouth Argyle Football Club and the A38 Devon express way. DESCRIPTION Entering via a wood framed door, you enter into a hallway, which gives access into the lounge. The lounge has a bay window to the front elevation, a feature open fire, with striped back wood flooring. There is an under stairs storage cupboard, which gives ample storage for shoes and coats, and opens up into the stairs and has a door through to the kitchen/diner. The kitchen/diner opens has French doors leading out into the rear courtyard, a range of wall and base mounted units, with a solid wood worktop over. There is an integral electric oven, a feature sink drainer unit, with a mixer tap over and a feature breakfast bar. The breakfast bar has a range of power sockets, plus an induction hob. The kitchen/diner has stripped back wood flooring; tiled splash backs and opens into the utility room. The utility room has base mounted units, plus space for a range of white goods, with a window to the side elevation. The utility room also has space for a work bench to allow the owner to work from home. There is a door leading through to the downstairs bathroom. The bathroom has a three piece white suite, comprising of a low level w/c, a hand wash basin and a panelled bath, with shower overhead. The bathroom has been tastefully decorated and is home to the combi boiler. Upstairs, the small landing opens into both bedrooms. The master bedroom is at the front of the property and has a wealth of character throughout including a feature fireplace. The wardrobe has been converted into a small office space. The second bedroom is also a good sized double, has a window to the rear elevation and a feature fireplace. OUTSIDE Externally, the property has a level rear courtyard which is mainly hard paved. The courtyard is easterly facing, with a gate to the rear service lane. The courtyard also has a raised flower bed, and has enough space for a BBQ.